Covering centuries of fantastical art, a new broad-ranging exhibition at David Zwirner brings together the bizarre from across art history. Endless Enigma: Eight Centuries of Fantastic Art places contemporary artists in context with artists with similar visions from the past, and shows how forward-thinking those artists from the past were. With over 130 works from international museum and private collections, the exhibition makes connections from the twelfth century to the present day. 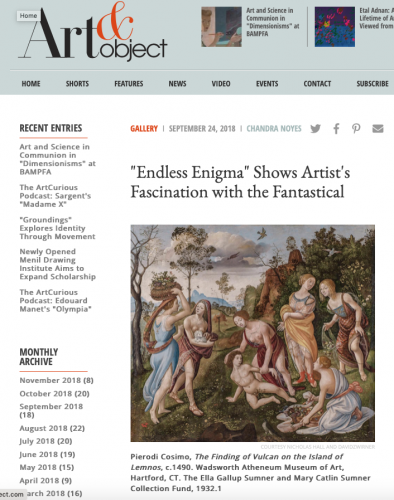 Endless Enigma draws its inspiration from Alfred H. Barr Jr.’s legendary 1936 exhibition at The Museum of Modern Art, New York, Fantastic Art, Dada, Surrealism. This ground-breaking exhibition introduced these movements to American audiences for the first time and placed them in art historical context. Endless Enigma uses some of the then cutting-edge Dada works from the 1936 exhibition as context for contemporary works. Artists such as Kerry James Marshall, Lisa Yuskavage, and Marcel Dzama are at home beside important works from Yves Tanguy, Man Ray, and René Magritte. A crowning piece of the exhibition is a version of Hieronymus Bosch’s The Garden of Earthly Delights, one of art history’s favorite and most bizarre works, painted by a contemporary follower of the original artist. The exhibition’s six themes—Monsters & Demons, Dreams & Temptation, Fragmented Body, Unconscious Gesture, Super Nature, and Sense of Place—touch on all the ways artists use their work to play with our perceptions of reality. Endless Enigma shows that there is a fine tradition of distorting that which once seemed normal to engage with our subconscious hopes and fears. Endless Enigma: Eight Centuries of Fantastic Art is on view through October 27, 2018, at David Zwirner’s 537 West 20th Street, New York, location.